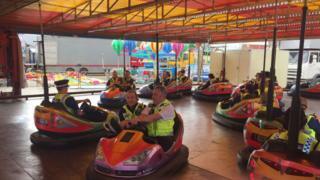 Police officers pictured riding the dodgems at Hull Fair were doing so as "light-hearted public engagement", force bosses say. The Sun newspaper printed the pictures taken from an officer's Twitter page and said residents were "furious". But, Humberside's deputy chief constable Andy McDyer said he was "really disappointed in the article". More than 25 officers were on duty during the eight-day event, which attracted more than 500,000 visitors. More than 110 people have commented on the BBC Look North Facebook page, with most in support of the police. One post described it "as little light hearted fun that hurts nobody". Another said : "It shows that they are human too and like to have fun a move which I think will make it easier for children to approach them instead of being frightened." A spokesman for the Sun said the newspaper "stands by its story". He added: "We are happy with the story we ran and it speaks for itself." Mr McDyer said the officers were on a break and the photographs showed the "public face of policing". "Our officers had been out there for eight days," he said. "They've worked between 10 to 12-hour shifts, invariably not taking the rest periods they're allowed because they want to be out supporting the public. "This is about an opportunity at 12:30 last Saturday, before the fair was fully opened, before the public was really around to engage with stallholders because they are one of our major partners in this." Image caption Deputy chief constable Andy McDyer said the pictures showed the "public face of policing"
Mr McDyer added officers were praised by the public about the way they had policed the fair, which this year included armed patrols. The force said it had made four arrests during the week for minor offences. Earlier this year, it was rated as "requiring improvements" by Her Majesty's Inspectorate of Constabulary.